The week that started off with a bang in Boston also brought about sadness in São Paulo as a wire on one of the cranes in operation at the construction site of the New Arena snapped, dropping a load onto a group of workers, killing one and injuring another two. A thorough investigation will be carried out, as always when these kinds of unfortunately not so uncommon accidents happen. Work was supposed to gradually return to normal beginning on Wednesday, but until now (Thursday night) everything’s quiet at the construction site. During tonight’s game Against Sporting Cristal, our players wore a black arm band as a tribute to the deceased. The tragic accident is the wrong backdrop to announce the mega-agreement being finalised as these lines are written: unless something unexpected surface, Palmeiras and WTorre will shortly announce the selling of the New Arena naming rights to Europe’s largest insurance company, German Allianz. The deal is speculated to be worth some US$ 150 million for a period of 10 years, the New Arena joining the Allianz family members in Germany (Allianz Arena, Munich), England (Allianz Park, London), France (Allianz Riviera, Nice) and Australia (Allianz Stadium, Sydney). “Allianz Palestra”, anyone? Back to the Libertadores game. Palmeiras sent a decimated squad to Peru, as Kleina wisely opted for letting Henrique and Vinícius rest – they had two yellow cards each and thus risked missing out on the first leg of the knockout phase if booked in the last game – instead promoting Vilson and Ronny. Our men in green didn’t maintain the posture from recent games and managed the least likely: lose to already disqualified Sporting Cristal, while Tigre, in Assunção (! 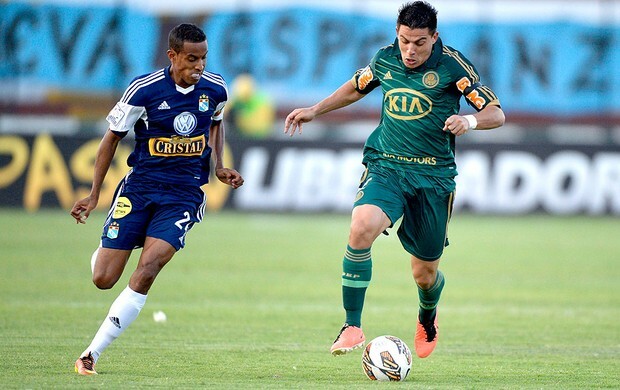 ), were beating Libertad by a margin of three goals and pushing Palmeiras down to second place. On stoppage time however, Libertad scored and propelled Palmeiras back into first position. Phew. In theory, easier competition in the next round and the advantage of playing the second leg on home grounds. EDIT: Tijuana/MEX are up next. First game away, second in São Paulo. Speaking of Henrique: our captain was called up by Scolari for the friendly against Chile on 24 April in Belo Horizonte. The centre-back will commemorate his return to the national squad in company of Leandro, the young striker enjoying his second opportunity to make a lasting impression. All in all, Scolari called up 18 players, all active in Brazil. Thankfully, Henrique and Leandro should not be missing any games for Palmeiras while serving the national squad. Scoppia che la vittoria è nostra! Although not today. But hey, we finished first, didn’t we?